Our 6-year-old had to try out the cool outdoor seating along the Kendeda Canopy Walk. As we entered the garden, we chose to go to the right and walk the Kendeda Canopy Walk to see four Chilhulys and the Cascades Garden where the giant topiary — the “Earth Goddess” — resides with a beautiful reflection pool full of brightly colored Chihuly glass. 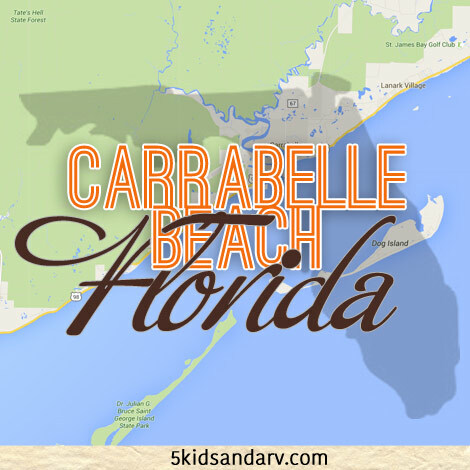 Nearly all areas are handicap accessible with nice wide paths to enjoy. If you’re limited on time and only have an hour to explore, you might want to check out some of their recommended “Power Hour” tours. The background on how the Earth Goddess was built and constructed to be a living topiary. Don’t forget to stop and smell the flowers along the way! 🙂 I loved seeing a beautiful bearded iris growing along the path — my Grandmother used to grow these along her house every year. My Grandmother used to grow the most beautiful bearded irises. The Atlanta Botanical Gardens make a great stop to stretch your legs if you’re visiting Atlanta. It took us about two hours to walk through the gardens at a leisurely rate, but I left feeling like I could have seen even more. We didn’t make it to the Children’s garden the day we visited, so we will have to go back and share that as well. The Atlanta Botanical Garden is a great place to stretch your legs and enjoy the sights while you take a walk. For a moment I felt like a princess walking in her palace grounds with the groomed hedges in the Levi Parterre garden. Had it not been sweltering hot in the middle of July, I would have loved to sit on one of those benches for a bit. Definitely best to visit early in the day throughout summer months and prime weather conditions in Atlanta will be in the months of April/May and October/November. I’ve been working on my own garden this year, so it was a real treat to see how professionals approached an edible garden. The vertical garden was a beautiful assortment of textures! I would have loved to see some aquaponics as an addition to how they were growing food. Edible Garden and perennial wall. Walkway to the Edible Garden area. Chihuly “Saffron Tower” (2008) with water mirror reflection pool in the Glade Garden. Remember, they ask that you not throw coins into the water features. The Fuqua Orchid Center was mostly closed off except for one small section, but that section was full of gorgeous and rare orchids to enjoy. It was like stepping into a slice of paradise! Own an orchid? 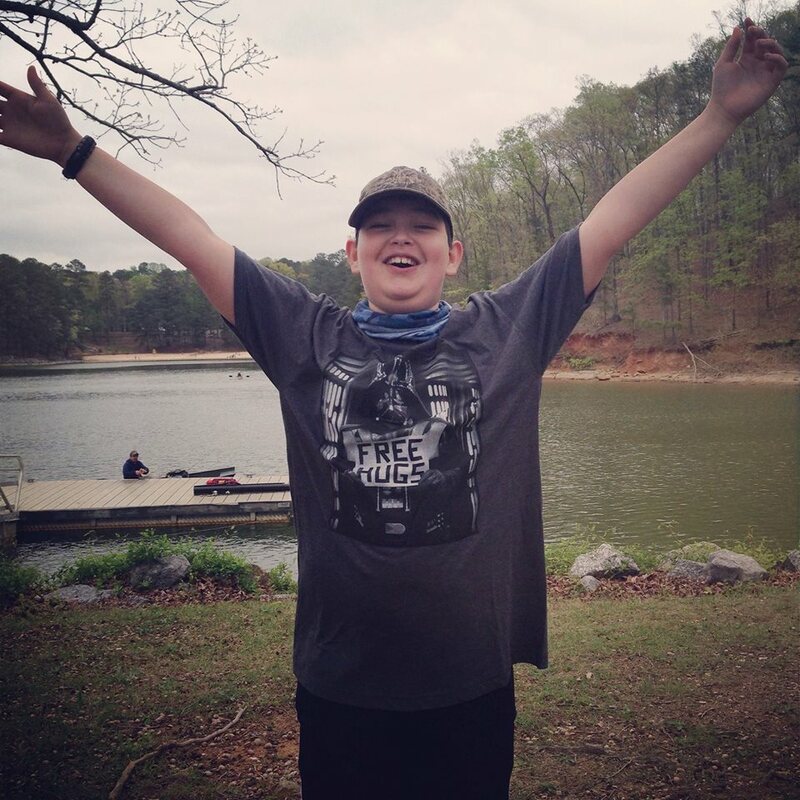 Check out the Atlanta Botanical Garden’s blog. Stepping into the Fuqua Orchid Garden is like stepping into a tropical paradise! We ended up purchasing a membership since it was the best value ($109 for 2 adults and up to 8 children + you get 4 visitor passes to use throughout the year). Don’t forget that your membership card also gets you a discount in the Gift Shop! Chihuly in the Garden and Chihuly Nights will only run from April – October of 2016, so be sure to stop in if you are traveling to Atlanta during those months! Weather Policy: The Garden is open rain or shine. Most gardens are located outside so dress appropriately for weather. There are indoor air conditioned and heated areas for visitors including the visitor center, café and conservatory and orchid center. Refunds or rain checks on admission ticket purchases are not granted for weather related reasons. The Atlanta Botanical Garden is located adjacent to Piedmont Park at 1345 Piedmont Avenue, Atlanta, GA, 30309. Tuesday, 9 a.m. – 7 p.m.
Wednesday – Sunday, 9 a.m. – 5 p.m. The Garden is open from 9 a.m. – 7 p.m. on Monday, July 4 for Independence Day. Wednesday – Sunday, 6 – 10 p.m.
Tuesday – Sunday, 9 a.m. – 5 p.m. 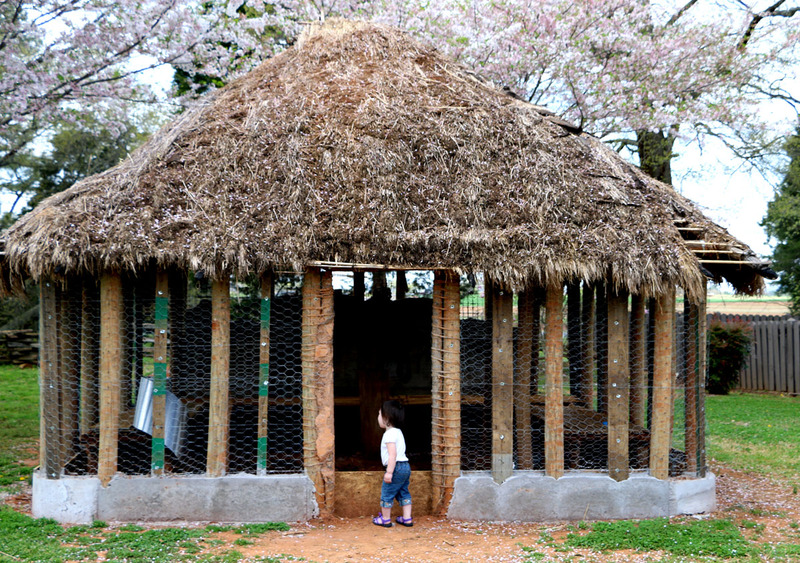 Please note: The Children’s Garden is closed for renovations until summer of 2016. The Garden is undergoing capital improvements including renovated gardens and new amenities. Closed Mondays and in the daytime on Thanksgiving, Christmas and New Year’s Day. In Atlanta, enjoy a Garden inspired menu from the team of Chef Linton Hopkins, a James Beard Award winner and popular local restauranteur, at the new Linton’s restaurant. Light snacks and refreshments are also available seasonally. Outside food and beverage are not permitted. During daytime hours, Garden admission is required for Non-Members. During Chihuly Nights, Garden admission is required for both Members and Non-Members. 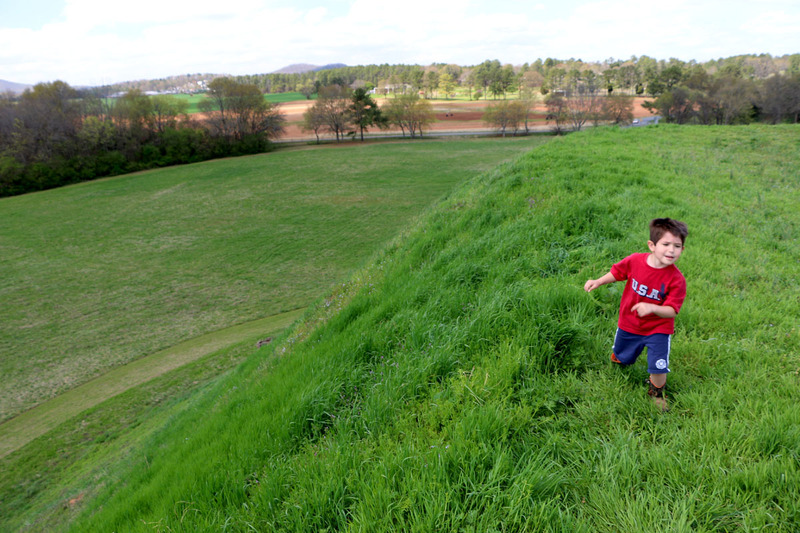 The Etowah Mounds provide a great way to enjoy the outdoors with your family! Plus, it’s only a 10-minute drive from the Booth Western Art Museum so you can do both if you are able to be on your feet for most the day. 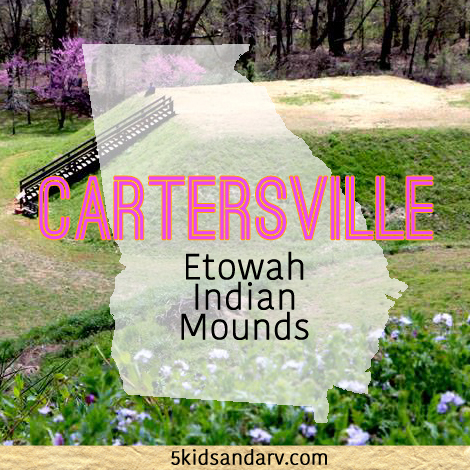 This region was home to an estimated several thousand Native Americans from 1000 A.D. to 1550 A.D., this 54-acre site protects six earthen mounds, a plaza, village site, borrow pits and defensive ditch. 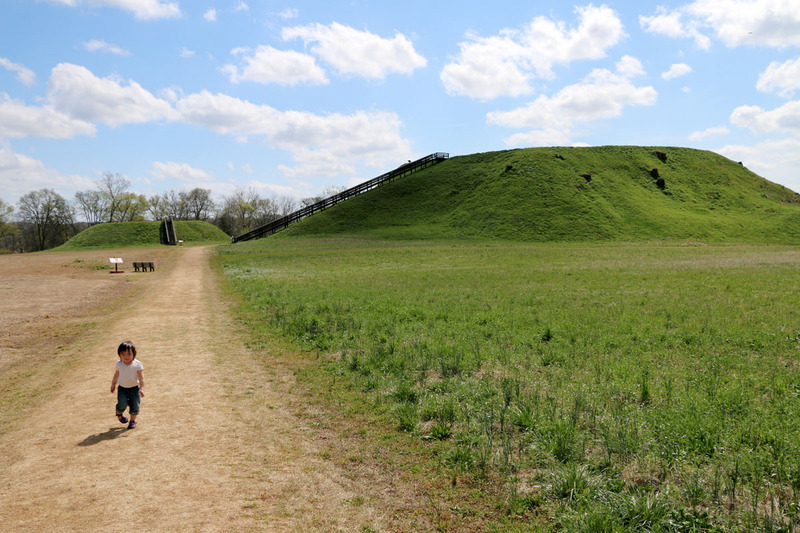 Etowah Mounds is the most intact Mississippian Culture site in the Southeast. We went in the first part of April when the trees were starting to awaken and some even in full bloom. 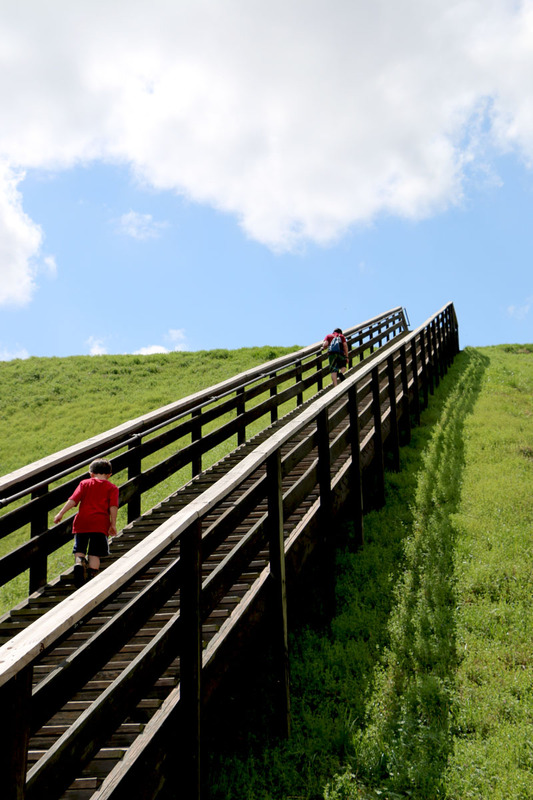 It’s best to climb the Etowah mounds when temps are moderate (60-78 degrees) as you will certainly break a sweat climbing the steps! I would not visit the months of June-September due to dangers of heat exhaustion unless you’re going early in the morning — especially with littles. I would not attempt this as a field trip in the summer personally. My kiddos tuckered out and water is a must. But the view is so worth it! Caution! The hills are steeper than you think! There are no safety rails, so good common sense is necessary to keep littles from tumbling down a very steep mound. This photo was taken at the top of the largest mound. *Children must be accompanied by parent or guardian. Be sure to check their website before you visit to see if there are any other restrictions as things change from the time of this posting. TIP: Don’t forget your water bottles and a snack! Though the mounds look small from the road, they are a good climb to the top! And bring a little bit of spending money as they also have a small gift shop where the kids can leave with a special item to remember their outing by. *Closed Mondays, Sundays, New Year’s Day, Thanksgiving and Christmas. For a more enjoyable visit, plan to spend 1–2 hours. The Georgia State Parks hosts various events throughout the year at the Etowah Mounds. 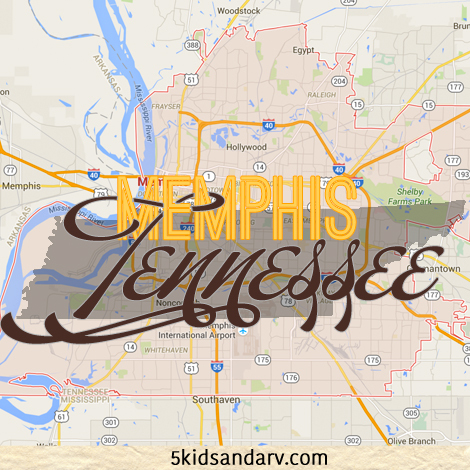 You may want to check their website for upcoming events in coordinating your travel plans. 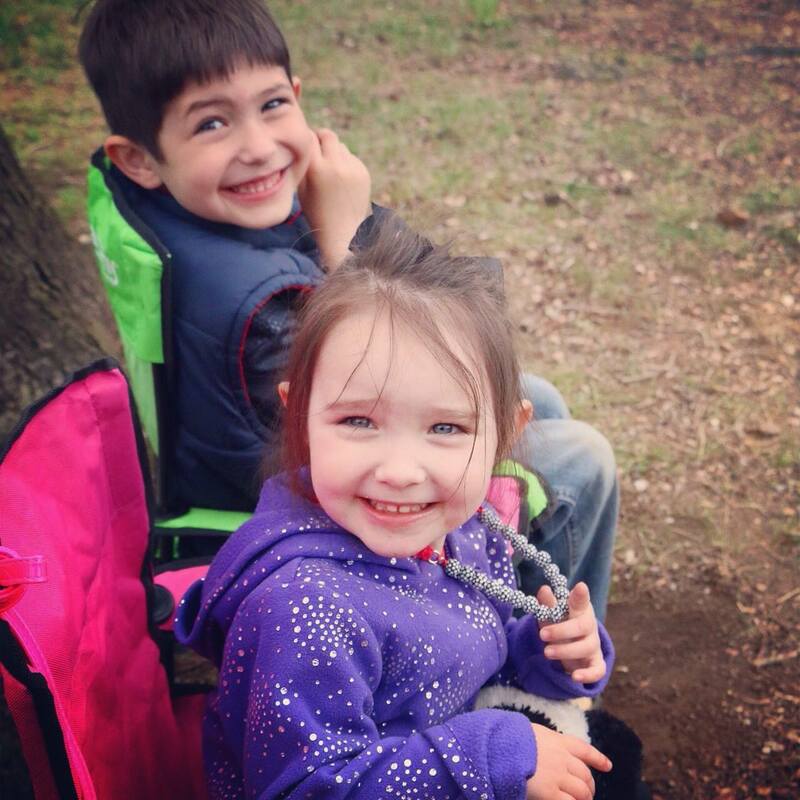 5 Kids and a RV recommendations are based on personal experience and do not represent the business or not-for-profit we feature. 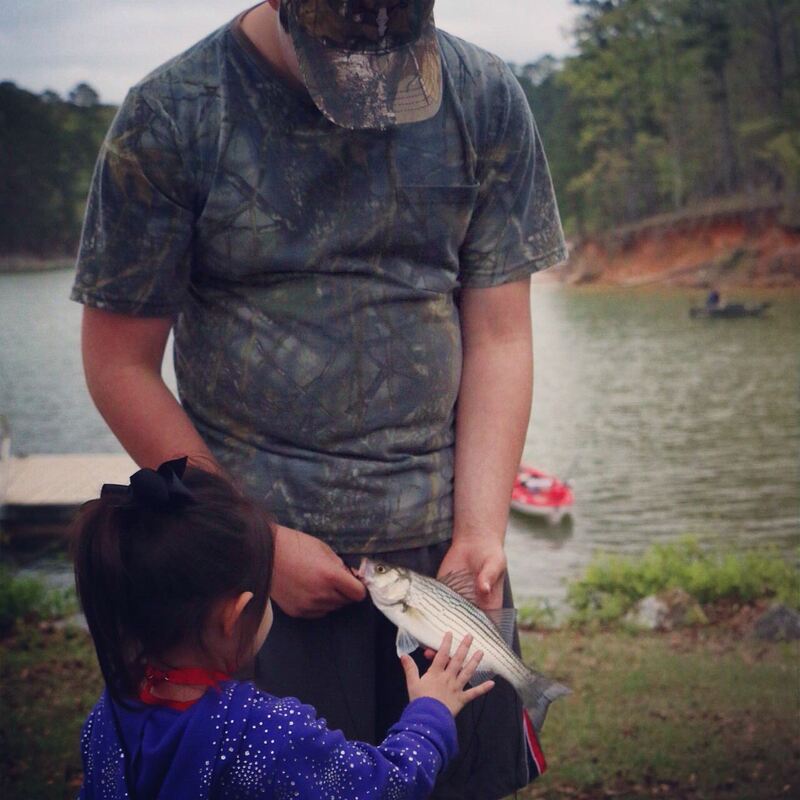 We share our experiences in an effort to inspire parents and caregivers to engage and explore with their children. 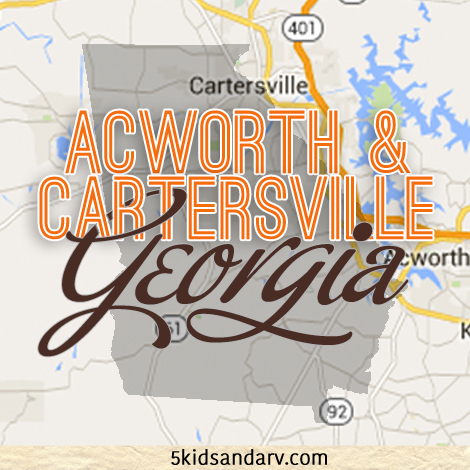 If you’re traveling out west of Atlanta, don’t miss this great learning opportunity for your kiddos! 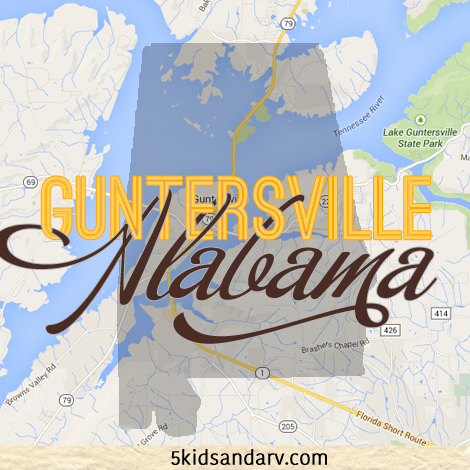 This location is close to Red Top Mountain RV campsites within a 10-minute drive (6 miles) and Lake Allatoona campgrounds. 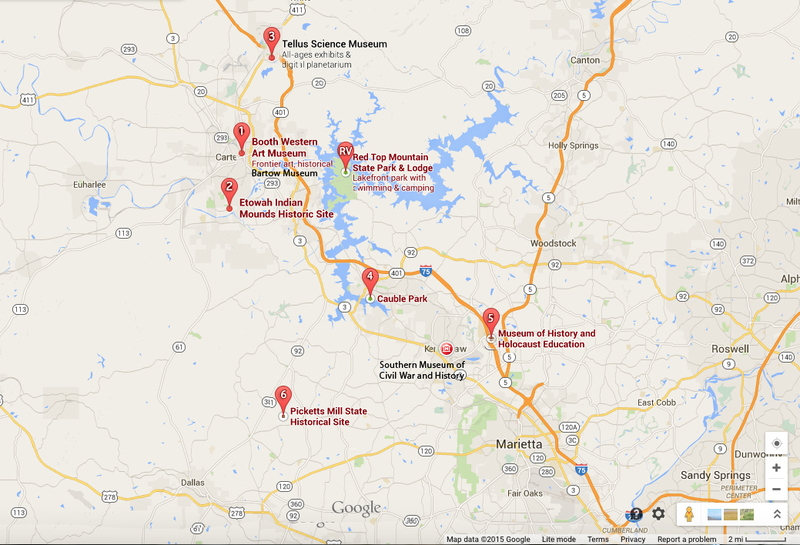 You can make a day of it and cover the Booth Museum and the Etowah Indian Mounds. 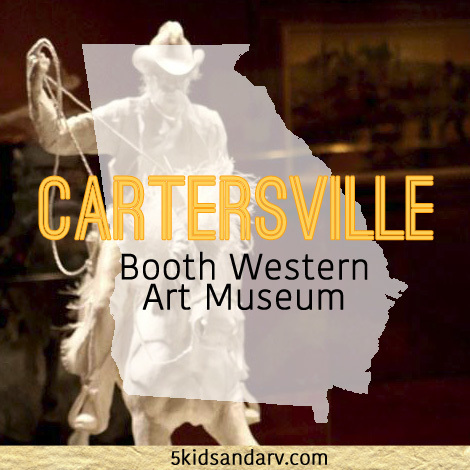 When I first heard that Cartersville, Georgia had a Western Art Museum, admittedly I sort of scoffed at the thought that cowboys and Native Americans could have artistic value. In my head, I had the stereotypical image of John Wayne or the Lone Ranger with his side-kick, Tonto and thought the entire museum would be the two sides at odds with each other. I also thought it would be a small collection. Boy, was I wrong on all accounts! The Booth Museum is the only museum of its kind in the Southeast and is the second largest art museum in the state of Georgia (The HIGH in Atlanta is reportedly the largest). 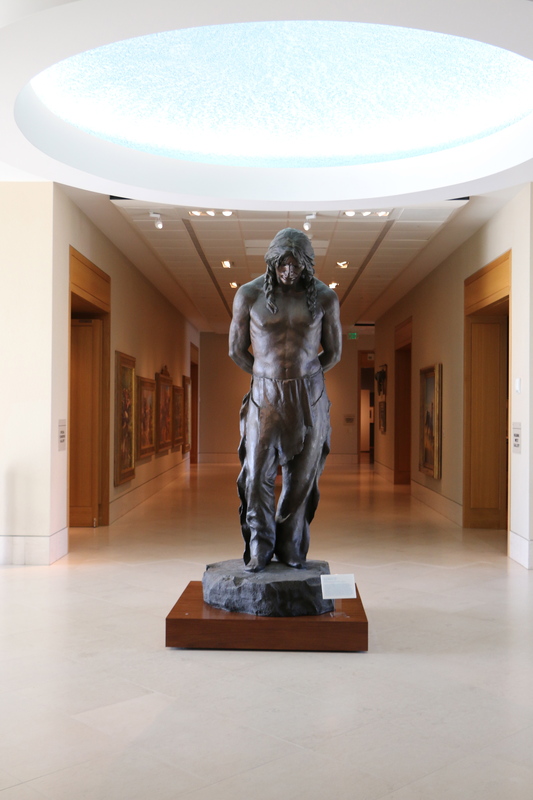 The Booth also houses the largest permanent exhibition space for Western American art in the country! The exhibits cover two levels and there are so many pieces of artwork, sculptures and artifacts that relate to Native Americans and America Cowboys that I lost count along the way. It also covers the Civil War era and has a Presidents exhibit as well as a children’s activity area on the lower level. There are eight galleries that are continually on display. We like to visit on the first Thursday of each month because we can all get in free (now that I have twins that are teens that helps me a lot on the pocket book.) It typically takes us 2-3 hours to go thru the exhibits and the kids love finishing downstairs on the lower level at Sagebrush Ranch where they have interactive activities that include riding in a pretend stagecoach, saddling up on a pretend horse, playing dress up, or doing one of several learning games or puzzles. And while you are there, you can share with your kids a quick physics lesson on how pulleys work to help lift heavy objects because The Booth has a beautiful glass elevator (pictured above) with real weights that lift and lower the elevator with ease and ever so quiet – one of only two of it’s kind in the country! TIP: When you check in at the information desk, be sure to ask about getting a Saddlebag (shown above in pic) for your kiddos during your visit to the Museum. The Saddlebag is filled with learning-related activities to be done throughout the Museum to help get your child actively engaged with the art. When selecting a Saddlebag, children have the option of three themes: “Cowboy”, “Native American”, or “Presidents”. Saddlebags are FREE and can be checked out from the information desk on the main floor of the Museum. *Children must be accompanied by parent or guardian. Be sure to check their website before you visit to see if there are any other restrictions as things change from the time of this posting. Membership is available for free admittance. TIP: The first Thursday of every month has free admission between the hours of 4-8 pm for all ages. 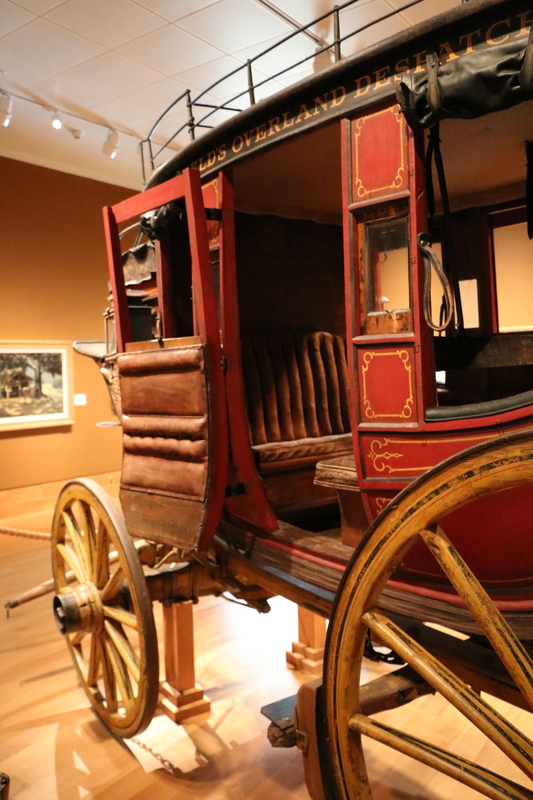 In addition, another free admission opportunity is available to Century Bank of Georgia members who can receive free admission to Booth Western Art Museum on the second Saturday and Sunday of each month. *Closed Mondays, New Year’s Day, July 4th, Thanksgiving and Christmas. A guided Highlights Tour is given everyday (Tuesday – Sunday) at 1:30 pm for all visitors to the Museum. This tour generally lasts about 60 minutes. 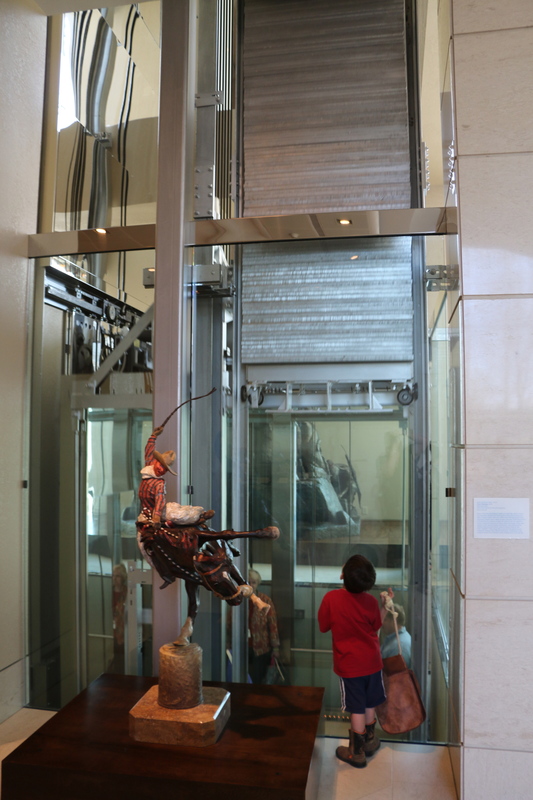 A guided tour is also available for groups of 10 or more who make reservations prior to visiting the Museum. 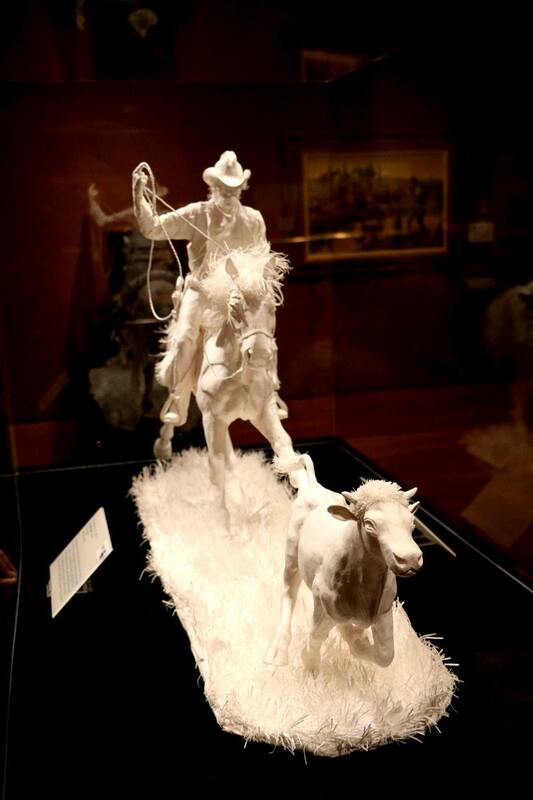 If you’re looking for other Western art museums…in addition to The Booth Museum, there are 10 or 12 major Western art museums in the U.S. such as the National Cowboy and Western Heritage Center (formerly the Cowboy Hall of Fame) in Oklahoma City; The Gilcrease in Tulsa; the Buffalo Bill Historical Center in Cody, Wyoming; the Autry National Center in Los Angeles, and several others. The only two in the East are the Eiteljorg Museum of American Indians and Western Art in Indianapolis and the Rockwell Museum of Western Art in Corning, New York.